Upgrading the kitchen can prove to be one of the most beneficial tasks you can take on in your home. This versatile space relies on dynamic kitchen lighting and design elements to properly illuminate all of your daily activities. While universal in the daily operations of the home, the kitchen can also be the most complex in terms of planning and proper execution. Our lighting store in Omaha was founded on the principle of empowering customers to expertly handle all of their residential lighting needs. Since 1953, The Light Palace has worked to ensure that all of our clients have had happy outcomes with their lighting projects. Today, our modern lighting experts are happy to provide solutions for homes of all shapes and sizes with our 10,000 square foot showroom. If you have a need for professional advice, be sure to reach out to The Light Palace for assistance! Our home lighting experts are here and ready to assist with all of your home remodeling needs. Today, we’ll continue our look into kitchen lighting tips to help our customers start their planning process for a complete home lighting renovation. Be sure to stop by our lighting showroom in Omaha for help with any project, from new bulbs to kitchen upgrades and everything in between! Your overhead and pendant lighting can help to create dynamic lighting solutions in the kitchen, but each fixture can only do so much. One crafty approach is to triple down on your indoor lighting scheme, installing a three-pack of pendant lighting to provide enough illumination for the room. Not only can three home lighting fixtures work in tandem to create a welcoming glow in your kitchen, they can also help to disperse light properly and eliminate shadows. Homeowners have found great success with track lighting, which is versatile, affordable, and easier to install. You can create a versatile scheme for your kitchen lighting needs, customizing the location of each bulb to truly enhance every activity. Setting the mood. Lighting doesn’t always need to be at 100 percent, and this switch will allow you to dim the lights, setting the mood for a variety of activities. From simple nightlighting to full-blown cooking adventures, it’s helpful to involve a switch that can create a different ambience for each task. Save in energy costs. Reducing the demand on your LED, fluorescent, and halogen bulbs will equate to a reduced energy bill. Increase light bulb longevity. Reducing the demand on your bulbs will also reduce the frequency of replacement, saving you the hassle and cost of replacement over the years. One task that slips a lot of minds until the project is complete is coordinating the color of your kitchen with the lighting scheme. Lighter paints, for example, are more reflective, reducing the wattage demands for the space. Keep this design aspect in mind as you get to work on your kitchen lighting upgrades. Otherwise, you may end up with a space that is either too dark or too blinding! 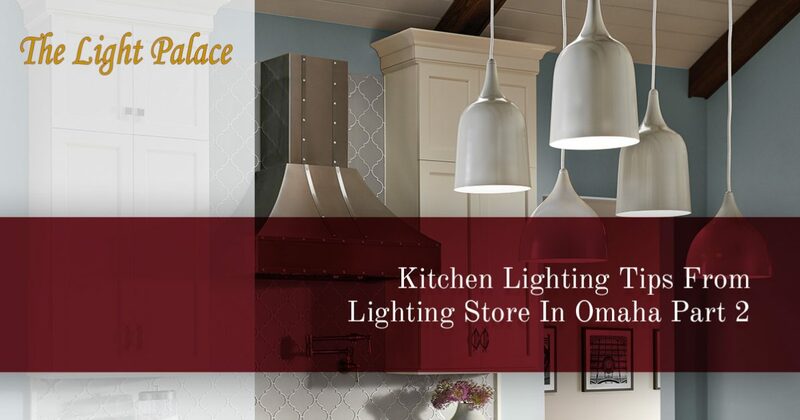 The Light Palace is proud to be your lighting store in Omaha, providing top-notch solutions to Nebraska homes since 1953. Contact us for assistance or stop by our vast lighting showroom to get started today!